Entertainment Weekly is continuing their coverage of Star Wars: The Last Jedi (having already revealed two upcoming covers, and several new stills from the film) with their first feature story, focusing on Finn and Rose and their relationship. EW's Anthony Breznican spoke with John Boyega and Kelly Marie Tran about what fans can expect in the new film. Apparently, despite his heroics in The Force Awakens, Finn is still looking to get away from the action. However, he meets Rose who has a very positive impression of him (she thinks he really is a big deal in The Resistance). "He appreciates the adoration for a second, but when he meets her, Finn is trying to escape the whole war. He’s trying to leave. And she comes in and basically gives him a depiction of himself that wasn’t necessarily true. (...) It’s now an opportunity for him to be the best he can be. He has to make a decision, and Rose is there to help him make that choice." 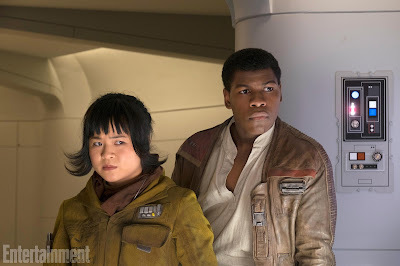 While everyone now knows of Finn's heroics (helping take out shields on Starkiller Base, facing off with Kylo Ren in a lightsaber duel), Rose's journey to becoming a hero is just beginning. "Poe Dameron is super cool. Finn’s super cool. Even though [Rose] is good at what she does, she’s not known. She’s not cool. She’s this nobody, this background player, which is what makes her interesting. She’s not the best. She’s not royalty. She’s someone who is just like everyone else." The two will eventually wind up on a mission to Canto Bight. While it's easy to compare what's going on in The Last Jedi to The Empire Strikes Back, writer/director Rian Johson says the similarities are purely surface level. "I just tried to kind of ignore that aspect of it and have the story take the shape that it needed to. But look, Rey is off in a remote location with a Jedi master, and the Resistance is in a tough spot, and we’re intercutting those stories. By its very nature, there are some structural parallels. But these are new characters, they’re dealing with new things, and that ultimately is what defines the movie. So I think that’s going to be unique." You can read the entire feature on Finn and Rose over at EW.